Hi everyone! Yay! 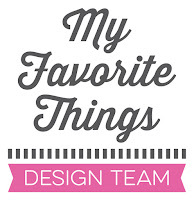 It’s time for the My Favorite Things May product launch! Today, you can see all new products and they are available right now in the MFT online store! This set is so versatile! You can use it with so many other MFT or Birdie Brown images! Or like here, without any image. No coloring, just die cutting! LOL For my card, I used MFT cardstock to create this scene: Pure Plum, Tickled Pink and Jellybean Green, as well as Smooth White and Whip Cream. The wooden background is from the Tranquil Textures Paper Pack. I die cut the curtains from the Dots & Stripes Sorbet Paper Pack and, the leaves from the Leafy Greenery Die-namics set and the flowers from the Die-namics Spring Garden. I created the window flower box using a die cut border from the set and a small strip of paper that I cut with my scissors. I added Liquid Pearl on top of the flowers. The sentiment is from an older MFT set called All Heart. Don’t forget to check out the MFT May 2016 PDF release class where you can find a lot of inspiration and step-by-steps. I made a tutorial on how to create a duo of rainbow cards! Your cards are always so beautiful Francine!!! Can't wait to get all the new products from MFT!!! What a sweet card! Lovely color combination. This window is so cute. Love it! This is the perfect Spring card! I love the plum and yellow together. Love your window card. It is so pretty. I love all the things in this release. to place behind the window. Love your card. Can't wait to get the newest release. I would like to live in a house with such pretty window, brilliant work with those products and colors. Love the window card. Simple and perfect. Francine, YES!!!! This is the first card on the blog hop that I feel I can repeat! Hahaha! No coloring, just die cutting!! Thanks for sharing!!! I love the color combo. Cute flower box. Love this beautiful window creation! Great card...love the design as well as colors. Very sweet card, lovely design. Such fantastic colors for your window! I am going to be copying this for sure!!! Now I feel like I need those window dies! Your card makes me want to buy this die!!! Beautiful! simple, elegant and so beautiful card! What a fabulous design! This window set is awesome! Great card! I love the patterned paper that you used for the background and the purple shutters! So pretty! Perfect paper for the wall, too. This is just gorgeous! I love that new window die - perfect! Such a beautyfull cozy card. Love it. What a great Homecoming card...very welcoming. Your cards are always so beautiful! I love this little window scene and everything in this release! The shutters on the window look so real! Cute card! Love this window die, can hardly wait to get my haul...LOL. Great card! Such a cute card. Love the window with the curtains. So pretty. Love your window scene and the pretty colors. Beautiful card. Love those tiny flowers in the the window box. Such a pretty card, Francine! Pretty card - love the new release! Darling card! Love this window set! Great details on your sweet card! The window is so beautiful!! Wow! So striking and realistic! The window is one of my faves from the release. Great card. Lovely window scene, one of my favourite set of the release! A very sweet card. I adore window scenes...they give you such a warm, homey feeling. I love the yellow polka dot curtains. Sweet card, love the color scheme. Elegant window scene. Love your color choices. Adorable card! Francine, what a darling card this is. Your window card is so cute!!! Love it! Cute card! Thanks so much for sharing. Beautiful!! This little scene is so sweet; love the colors you used. 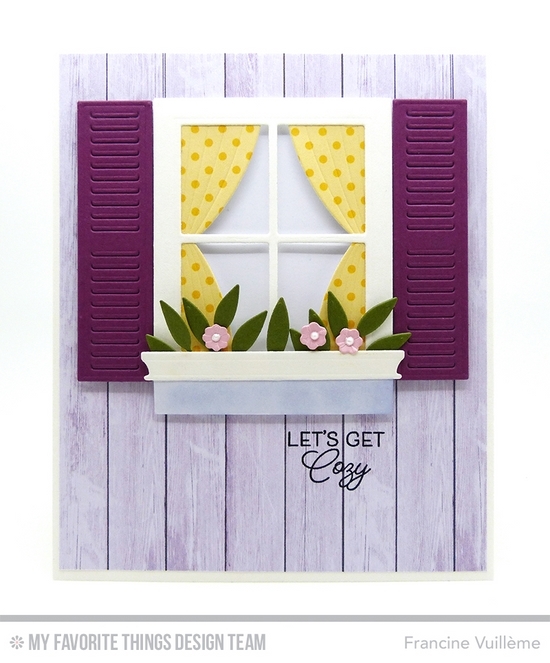 I love this new window die set, and your purple shutters are so fun! Fun and unique card design! Cute card & wonderful colors! What a sweet little window scene! Love it! Love these kinds of designs. they look so homey and warm. Love this card. I like that it's all dies. That window die is great. I absolutely love the color combo on this window card! Cute as can be!!! You are so incredible - everything that you create is so full of color and beauty!! love the purple shutters. I have always been a sucker for window scenes.